Enter in your mobile phone number or e-mail address and we will notify you when g2 HD MicroSD Admiralty Gulf to Cairns is back in stock. Bluechart g2 HD marine maps allow you to see your vessel's precise, on-chart position in relation to navaids, coastal features, anchorages, waterways, obstructions, restricted areas and more with 1-foot HD contours for a more accurate depiction of bottom structure for improved fishing charts and navigation in swamps, canals, marinas and port plans. 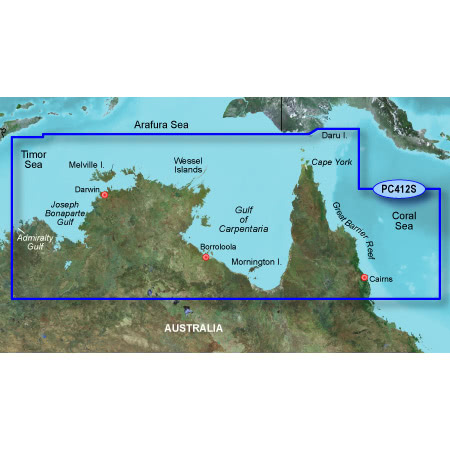 Detailed coverage of Northern Australia from Admiralty Gulf to Cairns. Also includes detailed coverage of Joseph Bonaparte Gulf, Darwin, Wessel Islands, Gulf of Carpentaria, Cape York, and the Great Barrier Reef. $699.00 In Stock: Ships Today! $549.00 In Stock: Ships Today! $599.00 In Stock: Ships Today! $347.00 In Stock: Ships Today! $674.00 In Stock: Ships Today! $580.00 In Stock: Ships Today! $684.00 In Stock: Ships Today! $1,049.00 In Stock: Ships Today! $939.00 In Stock: Ships Today! $999.00 In Stock: Ships Today! $2,822.00 In Stock: Ships Today!